Twelve hundred years ago, the demons and their allies destroyed the last zdrell master, the only kind of wizard who could challenge their mastery of the world. Master Silurian, though not a zdrell master himself, has been fighting demon magic all his considerable life and hoping against hope that a new zdrell master would enter the world. As the demons and their wizards are nearly ready take over the continent and cement their hold over the entire human race, Jonny is discovered by Silurian, a boy, who untutored is able to manipulate magic like the zdrell masters of old. 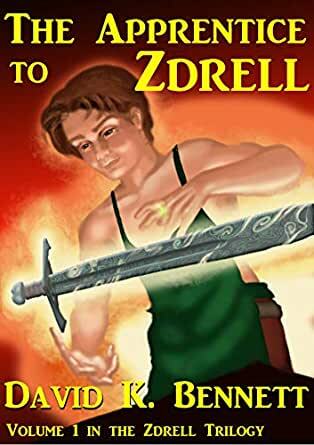 Can Jonny learn and Silurian train this boy while keeping him alive long enough for him to become a new zdrell master before the demons sweep the continent and gain control of the entire world? David K. Bennett is a reader and writer of Fantasy and Science Fiction. He lives with his wife, youngest son, and cat in Simi Valley, California, USA. The story is of the young boy who is discovered to have an ancient style of magic and covers his ups and downs through his apprentice years. Good writing and pacing. Great plot and magic system. Finished it in just a few hours. Hope the next one comes out soon. A very solid fantasy read that begins slowly at first but really hits its stride halfway in. The slower bits in the beginning are the necessary foundations for the impact the story packs as it wraps up this chapter of the series. You struggle along with the main character as he figures out the well constructed and complex system of magic presented and the setup pays off. I really enjoyed the magic system; it has enough variety to be continually interesting and is distinct from other types seen in other fantasy books. It is almost a character in and of itself in the story. Overall, a great read. Very much looking forward to the next installment. 4.0 out of 5 starsGood story! When can we see the Next One? Dave tells a great story. It was a fun read, and it holds together very well. I'm excited for the second book! 1rst of series--debute novel. Nothing about this book stands out, but it is entertaining. A young boy is rescued from poverty and finds out he has a gift for magic. I got the impression at the end that the author isn't sure if there will be a #2 book, which I found disappointing and kind of a letdown. What the author really needs is volume--2or 3 completed trilogies, to start building a fan base. This author goes on my to be watched list (which means I'll check on this author every month for 18 months or so for a new book), after which I'll assume the author gave up on writing or else the author will take another 8 yrs to put out the 2nd...as he had the idea for this one back in 2000.